As weight loss seems near impossible when you’re living with PCOS, CINNAMON could be of help. Over the last 10 years it has been used to aid women with insulin resistance associated with PCOS and those with type 2 diabetes. 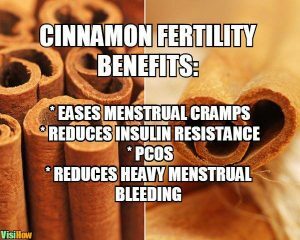 One study suggests cinnamon may also reduce insulin resistance by slowing the movement of food from the stomach to the small intestine. This slows the breakdown of carbohydrates, which is important for people with diabetes and women with PCOS. This keeps us full longer. Have 1 tsp organic cinnamon powder each day. Put it in your coffee, Bliss Balls, smoothie, desserts, chai – or you get the herbal extract or tablets for your naturopath of health food store.